Today, blasting is used as an alternative to traditional engraving, when matt surfaceas are wanted. Blasting, patented by B.C. Tilghman 1870, is described in "The book of Inventions" from 1901: Much cheaper and simpler (than etching) is to ornament the glass by sand blasting, threatening to completely outrange glass etching but used since 1871. After this is described how blasting imitates nature in that coastal dwellings have their windows matted by the sand thrown upon them by the gale and how different machines have been developed for the purpose. The description continues to tell how preparations must be made to make certain drawings show matt on a transparent ground or vice-versa and that this requires that a paper stencil is used to protect areas that shall be un-affected. The stencil is glued onto the object and she is now allowed to, on rollers or a little trolley, slowly move forwards and back before the mouth of the blaster. Thereby will the un-protected glass will be matted by the vicious attacks from the sand while the paper pattern quite stands for a time. 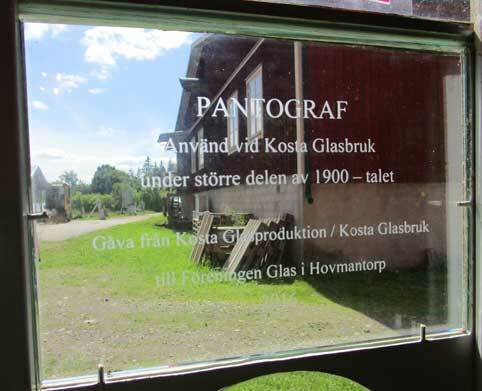 According to "Pukebergs Glasbruk" from 1946 sand blasting was first introduced in Sweden in 1884, likely for the production of lamp glasses. But Elisa Steenberg says in her thesis from 1952 (Svenskt adertonhundratals glas) that "test tubes for blasting" where delivered to Reijmyre already during the early 1850’s. This might indicate that some kind of blasting was used at Reijmyre 30 years ahead of Pukeberg. The picture to the left shows a template for blasting used at Pukebergs glassworks. The template is on display at Kulturarvscentrum in Växjö. Today blasting is well known and established and a number of blasting agents are available, each having its own characteristic. Very common is carborundum (aluminium oxide, Al2O3) powder but silicon carbide (SiC) is also frequently used. For impingement of the powder to the glass surface at the right velocity (about or above 50 m/s) centrifugal wheels can be used but most common is compressed air. As seen in the picture, usually some kind of clossed cupboard is used for blasting. The blasting powder can be re-used several times. Since the pattern is ultimately a part of the glass itself – it is not an addition on top such as a stoving enamel or a print – it cannot be removed without actually removing the glass surface layer. So blasting is preferred when the decoration is to last forever – like the donation sign beside our pantograph. Just as the blasting agents have been developed, so has the material for the stencil and one is no longer referred only to paper. Today, rubber, plastic and coated paper are all used and it is also possible to cover the object with a light sensitive emulsion, a photoresist. The photoresist is exposed using ultraviolet light and after development those parts to be blasted are washed away. 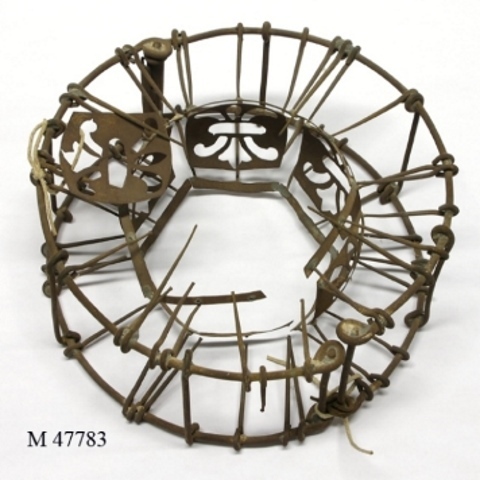 The advantage with the photoresist is that very fine lines and complicated patterns can easily be transferred to objects with a complicated shape. However, the process is quite complicated. 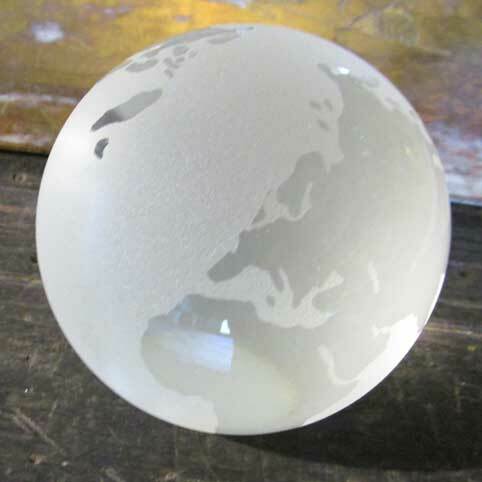 The little globe shown here was once a part of a cheap, mass-produced table lamp. We don't know how it was made, but probably it was blasted in a fully automated machine. For open blasting a hand-held air gun is used. Such guns can provide a very thin jet giving the opportunity to hand-draw patterns with a similar degree of freedom to that obtained with a hand engraving tool. By selection of blasting agent, particle size and impingement velocity a great variation of patterns and complexity can be obtained. While coarse particles will produce a coarse surface and can be used to create depressions in the glass will small particles be less abrasive and produce a different surface. For the most complex situations will the blasting operation involve many stages – each with a carefully selected combination of parameters. Such detail requires skilled eyes and hands and is only for the most advanced glass artists. Today’s automation and robots do not yet allow for the potentials inherent in blasting to be fully utilised in mass production.